Olsson’s goal – a free-kick causes panic and the unmarked Jonas Olsson lifts the loose ball over Hugo Lloris. After a cheap foul by Christian Eriksen, Morgan Amalfitano sends in a free kick. Vlad Chiriches seems to have picked up danger-man, Jonas Olsson, and has an arm out feeling for him. As the Spurs defenders are sucked to the ball, West Brom’s players hold their positions. Chiriches has completely left Olsson unmarked. 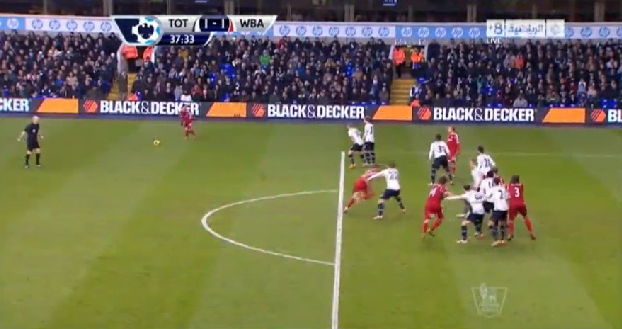 He, Dawson and Adebayor are essentially all in the same position, marking nobody. Lugano challenges for the ball, but doesn’t make contact. This seems to distract Adebayor who is unable to make a clean contact either. The ball hits Craig Dawson and falls kindly for Olsson to delicately lift it over Lloris. This was a poor performance from Spurs, who failed to get the ball into good areas for the two strikers throughout. Neither Sigurdsson or the disappointing Chadli seemed suited to playing wide in a 4-4-2, and Spurs only really looked threatening once Bentaleb and Lamela entered the fray. With Lennon and Townsend expected to be out for the Stoke game, Tim Sherwood will seemingly either have to abandon the 4-4-2 or look to the Development Squad for players more suited to playing wide. Soldado worked hard but looks short of confidence in front of goal. Dropping him will not help to build his confidence, but it might help the team to add another more defensive-minded player (Capoue?). The other option would be to play Adebayor from the left, and shift to a 4-3-3, with Lamela on the right. We've gone from playing 2 defensive midfielders to none at all. Why no Capoue? But TS is supposed to have an amazing football brain that has given birth to 442. Apparently, if you cut him in half he'll bleeds blue and white, which might just mean that he's a bag of pus. I hate to think what would happen if you cut his head open, but on the evidence so far air would whoosh out. Before Eriksen commits the foul Dawson has a chance to clear the ball, he try's to pass the ball to Ericksen when there is several WBA around him, this results in Ericksen committing the foul. If the ball is defended properly by Dawson there is no free kick, he had the option of putting his foot through the ball or putting it out for a throw. Personally I think Dawson is out of his dept, sometimes commitment is not enough, you need to know when to defend and when to play.